In the 1840s, a star in the constellation Carina decided to put on a big show. Ejecting 10-15 times the mass of the sun, it grew brighter and brighter, becoming, for a time, the second brightest star in the sky. It was noted around the world and the Boorong Aboriginal people of Australia even incoporated it into their oral legends. This star, Eta Carinae, is a luminous blue variable (LBV), class of stars that have run out of hydrogen in their cores and are known to be very large and prone to losing mass in explosive events. Eta Carinae, however, isn’t your ordinary LBV – it is much brighter than most LBVs and no one really knows how it ejected so much mass during the Great Eruption of 1840. Figure 1. Image from the 1950s shows the location of the material fifty years ago (red dots) overlaid with the current location of that same material (orange). Right image is the same as the left but taken at a longer, deeper exposure. A group of scientists have been taking a second look at Eta Carinae. Using observations with the Hubble Space Telescope spread out over two decades, they are able to look at how the material around Eta Carinae is evolving. By comparing the location of material in an early picture with location of the same material years later, the group calculated how fast the ejecta were traveling. Working backwards, they used the current positions of the material and the speed at which it was traveling to figure out when the material was ejected from the star (Figure 1). In addition to identifying which material came from the Great Eruption, they also identified two earlier explosions, one around 1250 A.D. and one in 1550 A.D. Interestingly, both the Great Eruption and the event in 1250 A.D. were both highly asymmetric, i.e. neither of them exploded evenly around the star but instead they shot of jets of material in one or two directions only (Figure 2). Figure 2. Motions of the ejected material colour coded by age. The newest ejected material shown in red and the oldest in purple. The longer the arrow the faster the material is moving. In addition to the observations taken at optical wavelengths, images of Eta Carinae have also been taken at X-ray wavelengths. It turns out Eta Carinae is surrounded by a partial shell of soft X-rays. Ejecta close to one part of the the shell are traveling at speeds approaching 3000km/s which likely came from the 1840s eruption. The X-ray shell is likely due to shock heating from the ejected material as it is pushed outwards. 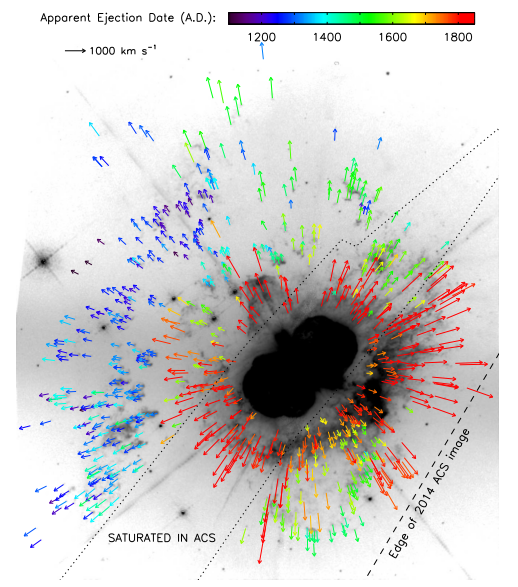 The motions of the clumps of material around Eta Carinae show that the star has likely undergone several major eruptions in the last thousand years. But the nature of these eruptions is not well understood, especially given their asymmetric nature. Models using one star only do not reproduce these asymmetric explosions well, but binary or three star systems may give rise to these situations. If two stars are close enough together, they could interact or even merge, which would result in a jump in luminosity and ejected material. However, this cannot explain the smaller eruptions fully. It remains a mystery how Eta Carinae ejected so much material. And who knows, maybe Eta Carinae could erupt again soon!